Our thanks to Michael Mistor for this Long-Playing exhibit of the late Dr. Don Rose. Michael says, "The recording of Dr. Don Rose was made on a simple Sears cassette recorder I had just received for my 17th birthday, and wanting to give it a try, I made the recording, mostly to be able to hear KFRC when I came home from school. By some twist of fate, the little cassette came with me later on in life and survived the 34 plus years."
. . . 610 weather, it's a little bit like Marvelous Mark's complexion, should begin to clear up later today . . . 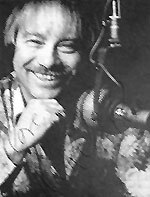 There is just no way around it, when it came to TOP-40 radio stations, and morning drive time listening, Northern and Central California's number one station for the 1970's was none other than KFRC-610/San Francisco with Dr. Don Rose!! His show was the kind that, even if you thought he was a "wack" you had to keep listening, just to see what else goofy was said. Dr. Don's morning show, with news and information, brought a warm laugh before you started your day, and what a great way to start. The man and the station were far ahead of their time. Dr. Don's crazy antics and the station's radio engineers, with the audio shaping made back then, created a sound nothing short of perfection. You could clearly hear the difference, and no other radio station came close. Even though Dr. Don Rose is no longer with us, and KFRC has changed from what we once knew, we still have memories (and tapes) to keep the Spirt of the Bay, the sound of lame jokes and laughter alive. May you who listen enjoy this audio clip as much as I still do.